Welcome to the MEMSCAP investor relations pages. 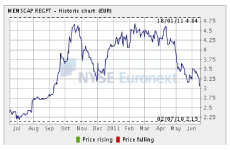 MEMSCAP has been publicly listed on Euronext, Eurolist C in Paris since March 1, 2001. Our ticker symbol is "MEMS" and our code is ISIN:FR0010298620-MEMS. On this page you will find a range of information on MEMSCAP's business, financial history, current performance, as well as financially related announcements, and upcoming events and contact information. You can contact us at investors@memscap.com. We also encourage you to sign up for the MEMSCAP investor e-mail alert so that we can keep you posted on company news.